For years, voters in California have been far more willing than lawmakers to embrace sweeping criminal justice reforms — until now. In the last week, the California Legislature has sent Gov. Jerry Brown bills to end cash bail and eliminate the felony murder rule that allows prosecutors to charge people with killings they didn't commit. They've bucked law enforcement groups and approved bills to open up police records — both personnel misconduct files and body camera footage — in a state that's been the most secretive in the nation, and again voted against police organizations to reform eyewitness procedures. They've voted to make it more difficult to criminally prosecute teens as adults, and to prohibit prosecutors from charging kids 12 and under with a crime, unless they are accused of murder or sexual assault. While law enforcement groups were able to kill some measures, the success of others — especially those that were defeated in years past — indicate that lawmakers are catching up with the electorate, said Democratic consultant Dana Williamson, a close adviser to Brown. Brown has supported a wide range of changes to the way California approaches incarceration and criminal justice and got involved earlier this week to push the felony murder bill across the finish line in the Assembly, where it was close to failing. Williamson has been involved in most of Brown's criminal justice efforts, including running a ballot measure campaign for Proposition 57 two years ago, which made it easier for many people to parole from state prison. Williamson said the strong support for more progressive criminal justice policies at the ballot box likely made lawmakers more confident about supporting legislative changes as well. "I think that the advocates tried for years and years to get a lot of policy that we [later] saw go onto the ballot through the Legislature, and I think there was just a nervousness about it," Williamson said. "It was sort of a tough on crime mantra or whatever, and you see these [ballot measures] pass, and they are passing by 65, 63 percent, and I think it probably gave a lot of these folks comfort." But the tough nature of some of the votes also show that police and prosecutors still hold major sway over some portions of the Democratic caucus — particularly when it comes to police accountability efforts. Police groups were successful in killing a bill that would have narrowed state law around when police shootings are legally justified. Defeating AB 931 — which would have limited the legal use of deadly force by police and possibly made it easier to prosecute police officers who do kill civilians — was perhaps the top priority for law enforcement groups this year and on Wednesday, Senate President pro tem Tony Atkins, D-San Diego, announced that there wasn't enough time to "clearly resolve the concerns that need to be addressed." Police groups cheered the news, while advocates for reform denounced it. But in a sign, perhaps, of the change in dynamic, the California Police Chiefs Association also issued a statement saying they are committed to "furthering these discussions in the next legislative session." Law enforcement groups certainly didn't embrace all of the criminal justice bills, but they did seem to pick their battles more carefully this year. For example, while the law enforcement community was united in its staunch opposition to AB 931, they did not seem as rabidly opposed to SB 1421, the police records bill. And some of the most powerful police and prosecutor groups ultimately stayed neutral on SB 10, the bail reform bill, after winning a number of concessions from the bills' authors. 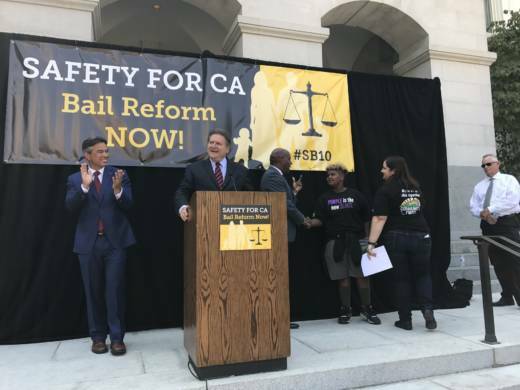 John Bauters, who spent two years lobbying in favor of bail reform for the advocacy group Californians for Safety and Justice, said he believes the narrative has changed in Sacramento around criminal justice. Californians for Safety and Justice wrote Proposition 47, one of the most sweeping reforms embraced by voters, which reduced many drug possession and nonviolent theft crimes from felonies to misdemeanors. "An increasing number of legislators understand that the reforms that have been adopted in the last few years have not resulted in changes to the overall patterns of crime in California," Bauters said. "Crime remains statistically at an all time low — it decreased in 2017 — and legislators are responding to that and have become less trepidatious about embracing reforms that bring justice to their communities." Williamson agreed, saying she hopes that the hard fought reforms of recent years indicate a broader "culture shift" among both lawmakers and the public at large. "My real hope is that we start looking at how we treat inmates differently. Are we really putting them in jail to rehabilitate them so they can learn something and go back to their lives? Or are we just trying to house people?" she said. "That's a fundamental question we have to ask ourselves."